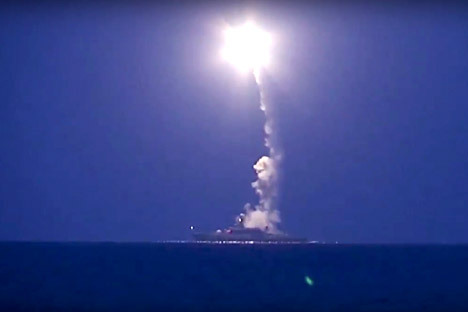 In this photo made from the footage taken from Russian Defense Ministry official web site, Oct. 7, 2015, a Russian navy ship launches a cruise missile in the Caspian Sea. Russia and the United States are the world’s only countriesthat possessthe full range of cruise missile production. Several Russian enterprises build these missiles, but the largest facility isthe Novator Design Bureauin the Urals city of Yekaterinburg. On October 7, 2015 Russian warships in the Caspian Sea used cruise missilesto destroy elements of the Islamic State terrorist organization in Syria. Flying nearly 1,500 kilometers over the territory of two states, Russian missiles hit the designated targets with pinpoint accuracy, not deviating more than two meters from the given coordinates. The missile’s tactical and technical characteristics remain a state secret. We can only judge these characteristics based on the features of the available export examples of the Caliber that are undoubtedly inferior to that used by the Russian military. The shells areup to eight meters long and weigh two tons including its engine and warhead. The speed of the missile’s flight exceeds the sound barrier by several times and reaches 3,000 km/h.The export versions do not travel farther than 300 kilometers, however,as was shown by the launch from the Caspian Sea, the Caliber’s effective range is more than 2,500 kilometers.This means that its tactical and technical characteristics are equalto the Tomahawk, the best U.S. cruise missile in operation. Apart from the Caliber, Novatormanufactures an entire line of world-class products. Another well-known development produced by this company is the sea-based Granatmissile complex. With a length of more than eight meters and weighing approximately 1.5 tons, this rocketwas designed to be launchedfrom a submarine torpedo tube. Within a few secondsafter firing itbursts from underwaterin a special container,climbs into the air, fixes its sights on its target and travels towards it at a low altitude and a maximum speed of 3,000 km/h. The missile case, created using a faint radio wave reflection technology, and its ability to travel just above thesurface of the earthseriouslyhampers the detectionand destruction of the missiles.A nuclear warhead can also be installed on the Granat, which given the missile’sadvanced characteristics, makes it a formidable weapon. Cruise missiles areone of Novator’s main specialties, but not its only one. Its conveyor belts still churn outanti-aircraft missiles with a caliber up to 152 millimeters for the Buk and S-300 anti-aircraft missile systems, as well as meteorological rockets for research purposes. Anti-aircraft missiles have been the main products at the company since its founding as anengineering subdivision ofUrals plant No.8 in 1947. In the 1950s and 1960s, the emphasis of production shifted with the recognition that artillery was clearly inferior to rapidly improving missile technology that was more suited to the task of destroying air, surfaceand underwater targets. The design bureau here producedone of the Soviet Union’s most famous rocket scientists, Lev Lyulev, from its ranks. Under Lyulev’sleadership Novatorwas first ableto establish itself as a separate enterprise and then became a leading company of the Soviet military-industrial sector. Today, Novator has more than 2,500 employees and an annual turnover of $300 million andis an important supplier of weapons for Russian and foreign military forces.